Explore Berlin and Potsdam’s top sights on your own terms thanks to this customizable, 7-hour private guided excursion. Relax in your private vehicle with included soft drinks and snacks as you pick among landmarks like the Kurfürstendamm, Museum Island, the Holocaust Memorial, Checkpoint Charlie, the Berlin TV Tower, plus Potsdam’s Sanssouci Palace. Receive a morning pickup from your Berlin hotel from your driver-guide aboard private vehicle. What you choose to do after that is up to you. No matter what attractions you choose to visit in Berlin, you’ll enjoy included drinks and snacks in the car, plus years of in-depth of knowledge about Berlin culture and history from your knowledgeable guide. Among the sights you might check out during your exploration are the Brandenburg Gate, the Berlin Victory Column, Gendarmenmarkt, Berlin Cathedral, Unter den Linden Boulevard, the one-time site of Hitler’s bunker, the Berlin TV Tower, West Berlin’s Kurfürstendamm, Potsdamer Platz, Bellevue Palace, Museum Island, the Holocaust Memorial, Checkpoint Charlie Hakescher Markt and famous neighborhoods like Kreuzberg, Friedrichshain, and Prenzlauer Berg. 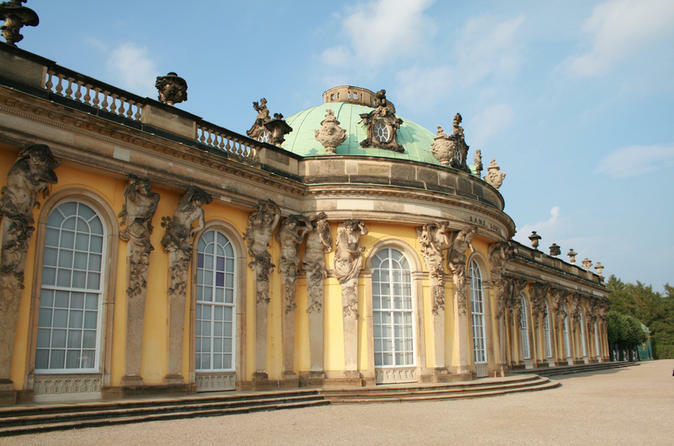 Finish your private trip in Berlin by proceeding to nearby Potsdam, where you can explore the luxurious surroundings of Sanssouci Palace. You’ll finish the day with a drop-off back at your Berlin hotel.